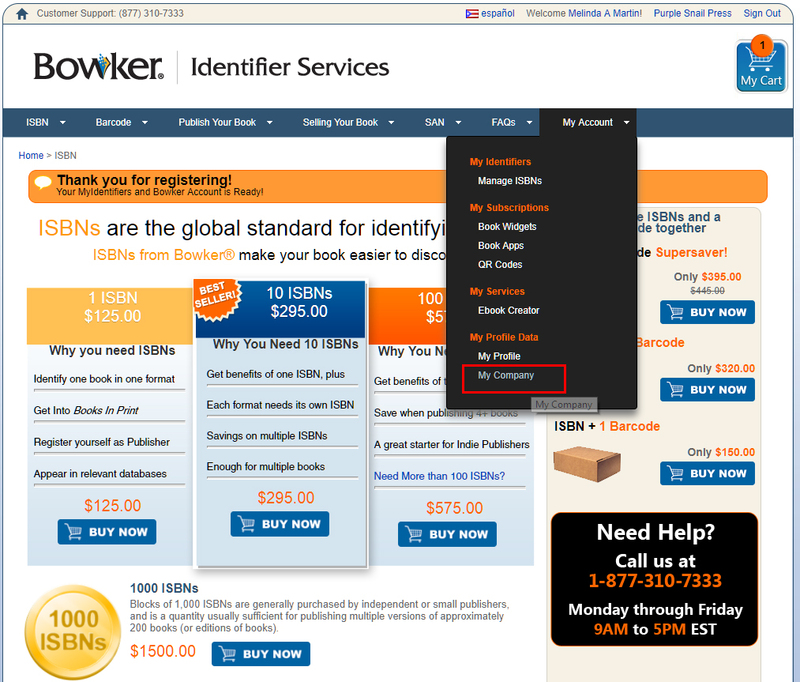 Americans have to buy their own ISBNs through a company called Bowker. Like most people, they are in business to make money. So while they provide needed services, they, of course, will also try to upsell you on things that you don’t necessarily need or for services that your cover designer and book designer will often include for no fee (like barcodes). I did sign up for them to email me with offers, and, lordy, do they send out the emails. If I wasn’t doing so much research, I would have unsubscribed long ago. I am attaching a screenshot showing how I filled in information when I set up my account. You’ll have a place to put your actual name and then at the bottom a place to put your company name. This is where your publishing company name will go. If you already have an EIN (Employer Identification Number), then your publishing company will become a DBA (Doing Business As) under that EIN. If you want to, you can actually file a DBA and have all of your ducks in a row. 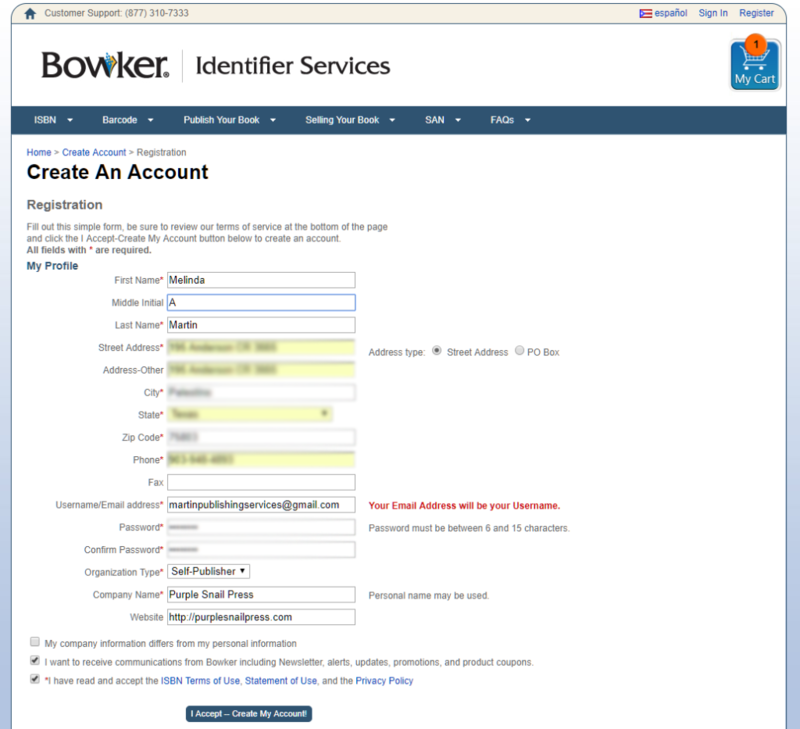 Or when you open your account with Bowker, you can set it up under whatever publisher name you choose without being organized. I’m not saying this is the best way. I’m just saying it’s an option. It is recommended that you choose a company name that does not include your own name. Like I chose Purple Snail Press for my publishing company name, not Martin Books. Part of having a publishing company is that you can set up different divisions inside your publishing company for different genres. For instance, Thomas Nelson is a huge publisher. They have several imprints: Nelson Books (Christian non-fiction), Tommy Nelson (children’s division), and Grupo Nelson (Spanish division). You don’t have to set up different divisions. I’m just letting you know that this is an option incase your publishing company grows into something bigger. 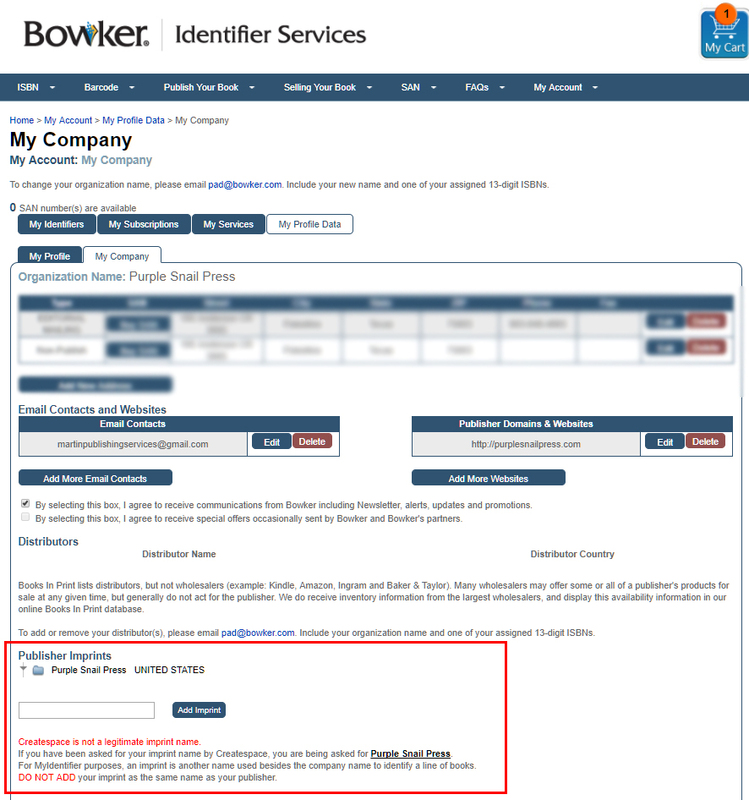 If you do NOT set up different divisions, then your imprint will be the company name that you chose during your Bowker setup. To set up different imprints, you will navigate to My Account–>My Profile Data–>My Company. I don’t have any imprints at this time, so mine just shows a single-level Purple Snail Press. However, CreateSpace’s system will require you show your book’s publisher as the imprint name that it is associated with, whether that is your top-level name or your second-level, which is the actual imprint. Purple Snail Press isn’t my imprint. It’s my publishing company name. Since I only have a top-level, that will also be what I use as my imprint when prompted by CreateSpace. Part of purchasing the ISBNs is assigning each ISBN to the book it belongs to. During this process, you will be asked to choose the imprint name for this ISBN. You will get a drop-down list, and if you only have a top-level, then that is what you will have to go with. For me, that will be Purple Snail Press. Let’s look at another example using “Homeschool Basics”. 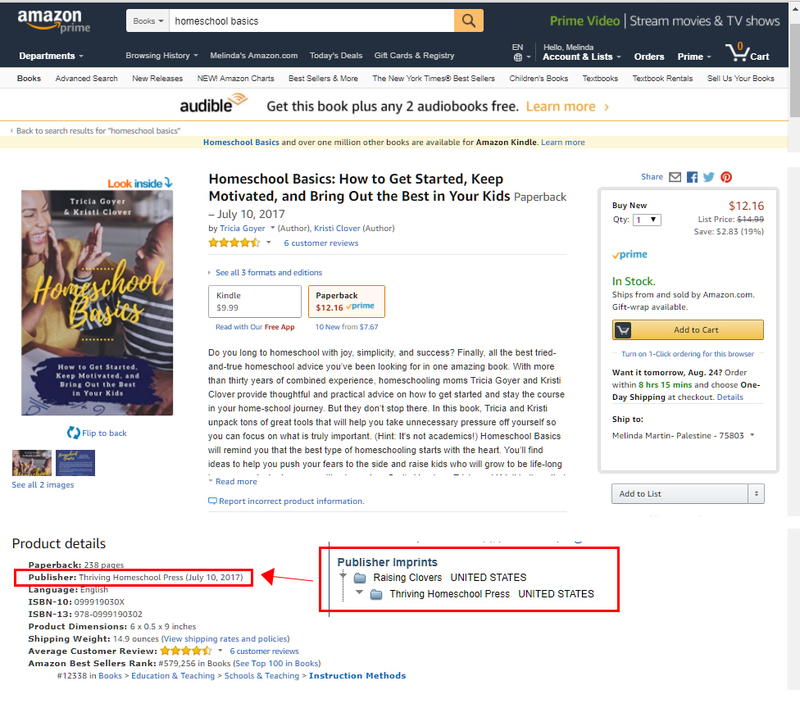 You can see here that the publisher for “Homeschool Basics” is listed as “Thriving Homeschool Press”. However, the publishing company name is actually Raising Clovers. Thriving Homeschool Press is the imprint. What Is in a Barcode? and has its own photo series dedicated to barcodes. Bowker sells “distribution ready” barcodes. These are barcodes that contain both an EAN-13 (ISBN) and an EAN-5 (retail price). You may not need to buy your own barcodes, though. If you are not focusing on bookstores or libraries and will only be selling your book via Amazon direct to individuals, then your cover designer should be able to generate an ISBN-only barcode for you. If he can’t, then this is a sign of an unseasoned book designer. If your designer is serious about designing book covers, then she will provide and place a “distribution ready” barcode on your cover. Most of your print-on-demand printers will generate the barcode for you for no extra cost but not all of them provide “distribution ready” barcodes. Some printers (independent book binderies) may require you to BYOB (bring your own barcode), or they will offer you an upsell to have them do that for you. Ideally, you would also have a logo created for your publishing company, and that will be used in certain key areas on your cover and inside your book to show the world that your book was professionally published. It gives your book more credibility in certain people’s eyes. You can just do something text-based for now until you decide what you want to graphically represent your new publishing company. Here is a publishing company logo design I created for Thriving Homeschool Press. It should be placed on the back cover and on the spine. Notice it’s in two different formats: rectangular and square. It’s also in color and in white. Your logo should be versatile (any logo, not just your publishing company logo). If this is your first venture into getting started as a viable business with a goal of making an income from your publishing efforts, you will want to get Carol Topp’s book, “Business Tips and Taxes for Writers“. I have personally met Carol, and she is a very well-respected member of the author and blogger community that I stem from. Would you like some IRL support? Schedule a no-fee call with me, and I can get you pointed in the right direction. Do you have questions or comments? Was I wrong about something? I promise I don’t know it all, and if you have had a different experience, I’d love to learn from that. Use the thread for this topic in the Self Publishing Support Group on Facebook.